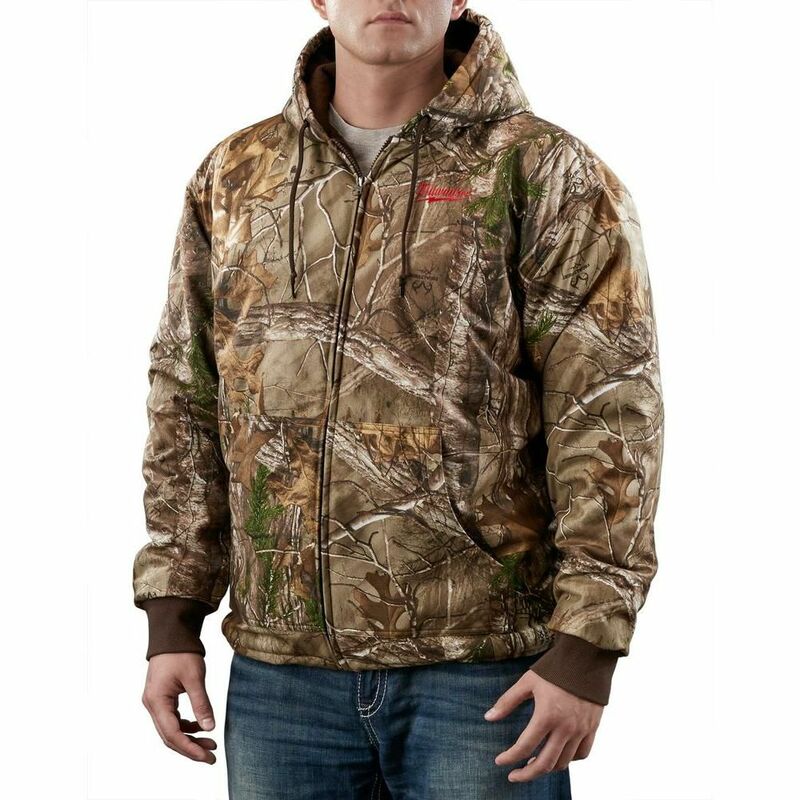 M12 CAMO XTRA HEATED HOODIE W/ BATTERY - 3X Milwaukee<sup></sup> M12 Realtree Xtra<sup></sup> Camo Heated Hoodie: A versatile heated solution for the outdoorsman, the M12 Cordless Realtree Xtra<sup></sup> Heated Hoodie integrates (3) carbon fiber heating elements between a durable water repellant exterior and waffle-weave thermal liner to distribute and maintain heat across core body areas. An adjustable heat zone that spans the chest and back provides the right amount of heat for any season. In fall and spring months, the M12 Camo Heated Hoodie can be worn as a rugged piece of outerwear. In the harshest winter conditions, it works best as a solitary base layer that allows users to shed bulky undergarments while generating and holding heat close to the body. Featuring special noise-reducing fabric and the Realtree Xtra<sup></sup> Camo pattern, the hoodie provides up to 6 hours of continuous heat per battery charge while utilizing the same M12 REDLITHIUM Battery technology that powers 60+ tools. All M12 Heated Hoodies are washer and dryer safe. M12 CAMO XTRA HEATED HOODIE W/ BATTERY - 3X is rated 2.0 out of 5 by 2. Rated 1 out of 5 by Pooch from I ordered this because stores never stock 3x sizes. I was excited to think I was able to order a ... I ordered this because stores never stock 3x sizes. I was excited to think I was able to order a sweat shirt that would fit. The heated sweat shirt was not true to size. The shirt cuffs ended up midway between my wrists and elbows. The clerk even commented the size should have been rated as a large. Had to return due to very poor fit. Rated 3 out of 5 by Anonymous from Heated hoodie The quality of the item seems good. The heating works ok but I'm not impressed. It will sort of take the chill of but barely. If you think it will get as warm as the seat heaters in your car it won't. The biggest issue I have with the hoodie is the pocket for the battery stretches and the battery hangs down below the bottom of the hoodie. It becomes uncomfortable and gets in the way.